Picture at the 50th reunion of the Class of 1960 of Clearwater High School. 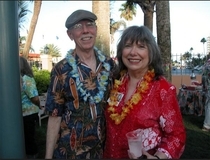 Moi, with my DH, Robert Craig, at the Luau, the first evening. Great people, good fun to be had. Guinevere aka Gwenni, after the "she-ro" in The Earth Hums in B Flat, the newest member of the family. On the loveseat at home with a recent excellent book - The Colony of Unrequited Dreams. Today (08/16/12) I removed a few pictures. Two of my cats have crossed the "rainbow bridge". Charlie & Mikey both live on in my memories and my heart. I'm enjoying making friends through LT and find it reassuring and wonderful that so many of you read the same books that I read and love. You are some of the funniest brightest people I've met. I wish we could all meet at the local pub for a real time chat. Groups1010 Category Challenge, 25 Book Challenge for 2010, 75 Books Challenge for 2009, 75 Books Challenge for 2010, 75 Books Challenge for 2011, 75 Books Challenge for 2012, 75 Books Challenge for 2013, Biographies, Memoirs and Autobiographies, Club Read 2009, Club Read 2010 —show all groups, Common Knowledge, WikiThing, HelpThing, Deep South, Le Salon Littéraire du Peuple pour le Peuple, Literary Snobs, Mistress of the Art of Death ~ Early Summer 2009 Reading Group, Orange January/July, Reading Globally, What Are You Reading Now?